The other members of the Wise Ladies Chama were growing increasingly angry at Nancy, the treasurer. She had been missing a lot of meetings and several of the Chama’s contribution banking had been made late. Josephine, the Chama’s vice-chairlady, finally spoke up one Saturday afternoon at yet another Chama meeting from which Nancy was missing: “This is getting out of hand. How many meetings does she have to miss before we can remove her from office?” If they were bylaws written thoroughly, would tell the members in the Wise Ladies Chama exactly how to handle their dilemma. Bylaws are legal written rules that control the internal affairs of a group such as a Chama. They can be adopted as part of your Chama Constitution. Bylaws generally define things like the Chama’s official name, purpose, requirements for membership, officers’ titles and responsibilities, how offices are to be assigned, how meetings should be conducted, and how often meetings will be held. Bylaws also govern the way the Chama must function as well as the roles and responsibilities of its officers. They are essential in helping a Chama map out its purpose and the practical day-to-day details of how it will go about its business. Bylaws serve as the legal guidelines of the Chama, and the Chama could be challenged in court for its actions if it violates them. Bylaws are also sometimes mistakenly called standard operating procedures or policies and procedures, but those are really different things, as they tend to govern day-to-day operations and don’t have the force of law, which bylaws do. Why should a Chama have bylaws? Having bylaws can be helpful to almost any type of Chama, regardless of size or purpose. Determining exactly how your Chama is going to operate and putting that down on paper can help keep things running smoothly, provide the answers to tough questions (like what to do about a difficult member), save enormous amounts of time and deliberation, help you define your mission, or structure the Chama to correspond to that mission. Having bylaws helps keep your Chama focused on its intended purpose by specifically defining that purpose. The leader of the Chama should come up with a rough outline. The first draft may be easy for one person to complete on his or her own or it may require you to meet as a group and work together. This is not the time to get into lengthy discussions about the particulars of the bylaws; instead, you should put together enough generally agreed-upon information for the first draft, and leave the specifics for later discussion. After you have completed your draft of the bylaws, make copies for all the Chama members. If possible, get copies to them in advance of your meeting so they’ll have a chance to reflect and can have their questions, issues, prospective changes, or concerns ready. This will not only save time, but it will also make it much more likely that errors or ill-considered bylaws will be caught, and that the final version will mirror what everyone really wants. Get together and go over the bylaws together. Go over each article and section individually for approval, and do so carefully. It may seem tedious, but your bylaws are very important and should be handled with attention to detail. This is also the time you should consider whether your bylaws are fair and democratic. Do they distribute the power in your Chama in a fair way? Do they allow members enough of a voice in how the Chama is run? Take note and discuss any changes, voting when necessary. When you’ve worked through and made all the changes, have the final draft made. Make all the agreed-upon changes to the bylaws and meet again to go over the final draft. When everyone is satisfied that the changes have been made correctly and the bylaws are as they should be, you should vote to approve bylaws. The date that the final draft was approved should appear at the bottom of the bylaws in all future copies. 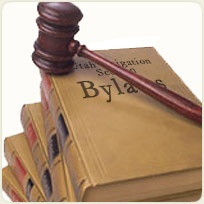 Ensure that your bylaws are commissioned by a lawyer as a legal document.